I'm a huge Batman fan. 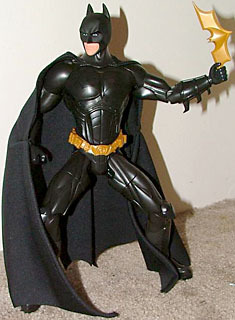 Fortunately for Bat-fans, action figures abound of the Dark Knight. Unfortunately for Bat-fans, the product is very hit-or-miss. I was initially pleased when Mattel announced they had picked up the Batman license and the legendary Four Horsemen would be handling a majority of the sculpting duties. I was less pleased, however, when Mattel eventually fell into the curse that Hasbro/Kenner had suffered when they previously held the license: Bat-variants. Pink Batman, Green Batman, Yellow Batman... In addition to that, Mattel originally shortpacked all of the non-Batman characters, infuriating collectors who wanted to get their hands on the excellent villain sculpts the Four Horsemen had produced. After all, what use is "Croc Hunter Batman" if you can't find a Killer Croc for him to hunt because he's one per case? I could go on for days about how Mattel muddled the Batman license, but to make a long story short: They've shelved the comic Batman line in the U.S. to focus on product from the upcoming movie, Batman Begins. The first wave of figures has hit stores, and for the most part they're extremely disappointing. Lackluster sculpts, poor articulation (where are the balljointed shoulders?! ), shoddy paint apps...is there any merchandise from this movie worth picking up? Well thankfully, the answer is an enthusiastic "Yes!" 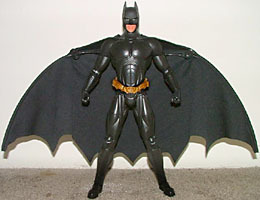 because Mattel has managed to produce a very nice movie-accurate Batman figure, in a more-or-less 1/6 scale. Ladies and gentlemen, may I present the 13-inch tall Action-Cape Batman. This figure pretty much blows the 6" Mattel figures out of the water in every single category. It almost seems like they weren't even made by the same company. The sculpt on AC Bats is great; his suit is nicely detailed and movie-accurate, and his face looks as much like actor Christian Bale as a mouth and chin can look like any specific actor. His legs seem a touch long, but that can be forgiven - stereotypical heroic proportions and all that. His head is hollow and rotocast, but the rest of him is solid plastic, except for his cloth cape. There isn't much paint to speak of, but what is here is impressive. His face and eyes are done very well for a mass market toy, especially since Mattel has an annoying habit of using glossy paint when they have to paint flesh. I'm happy to report that it's not the case here. Other than the head, there isn't much paint on this figure to speak of. His body is molded in a semi-matte black and his belt is a dull copper color. The bat symbol on his chest is slightly glossier than the rest of his suit, which is a nice touch. If you look at Mattel's track record, articulation has never been their strong point. However, this figure does a lot to change that image. AC Batman has a balljointed head, balljointed shoulders, peg joints at the bicep, hinged elbows, balljointed wrists, peg waist, pegged and hinged hips (think ML IV Punisher), peg joints at the thighs, hinged knees, peg joints right above the ankles, hinged ankles, and another ankle joint that allows for side-to-side motion for those wide-legged poses. All of the joints are extremely tight, and he can hold almost any pose you put him in very well. Much of this articulation has been worked into Mattel's 6" scale comicbook Batman line, but since they've cancelled it stateside, AC Bats is probably the most articulated Batman we'll see for a while, unless those rumors of Diamond Distributors striking an import deal with Mattel are true (I'll believe it when I see the figures in person). Accessories are kind of a low point on this figure. He gets a movie-styled batarang that he doesn't hold very well in either hand, and that's it. He's also got an action feature, and before all you readers issue a collective groan of despair, let me say two things: it's not that bad, and it's completely removable. There's a plastic mechanism that hooks onto the figure's back, and it features two thin plastic poles that feed into his cloth cape. The poles are attached to metal rods that can be retracted into the central plastic piece, and when you press a button, the rods spring out and the cape expands. It's kinda nifty and isn't too obtrusive, but if you don't like it, you can always unhook the mechanism and slip the poles out of his cape for a completely normal, action-featureless Batman. Everybody's happy. The only way this figure could conceivably fail is if the movie it's based upon ends up being terrible. The Caped Crusader has a spotty history on the silver screen, but with Christopher "Memento" Nolan directing a cast that includes Christian Bale (as the Dark Knight himself), Michael Caine, Ken Watanabe, Liam Neeson, Gary Oldman, Morgan Freeman, and Cillian Murphy, it's hard not to get excited. The toys, for the most part, are less exciting, unless you skip the 6" line and pick up AC Bats instead. Think Batman Begins will save the movie franchise? Tell us on our message board, the Loafing Lounge.